Part of the set of Vine of the Dead. The Fusebox Festival blows up Austin every April - one of my favorite times of year, five days crammed with the world's best and weirdest theater, dance, visual art, and music. "Slaves to a System," about Antony Hamilton and Alisdair Macindoe's extraordinary dance piece Meeting. "A Comic, Joyful, Poignant Lear," about David Neumann's delightful, heartbreaking I Understand Everything Better. "A Hand Touching the Screen Between Life and Death" about Jim Findlay's slow, powerful Vine of the Dead, 11 Ritual Gestures. A final piece called "Fusebox Rhymes" about the call and response, the fugue of repeated motifs and techniques the festival always finds. Still recovering from the Fusebox art-and-talk marathon. It's given me so much to think about, and I can't wait to dig back into my own writing. Just for completeness' sake, here are the last four blogs I did responding to various shows in this international hybrid arts festival. A photo from "Wind and Waves" at Zilker Park, part of Johnny Walker's Night Gardener project for Fusebox. Nothing to Declare: Crossing Borders: The Dictaphone Group's documentary piece about the abandoned Lebanese railway and about crossing borders. Final Fusebox Four-Show Kaleidoscope: Rudely cramming together Poison Squad, Electric Midwife, Phone Homer, and Zen Songs and Prayers. 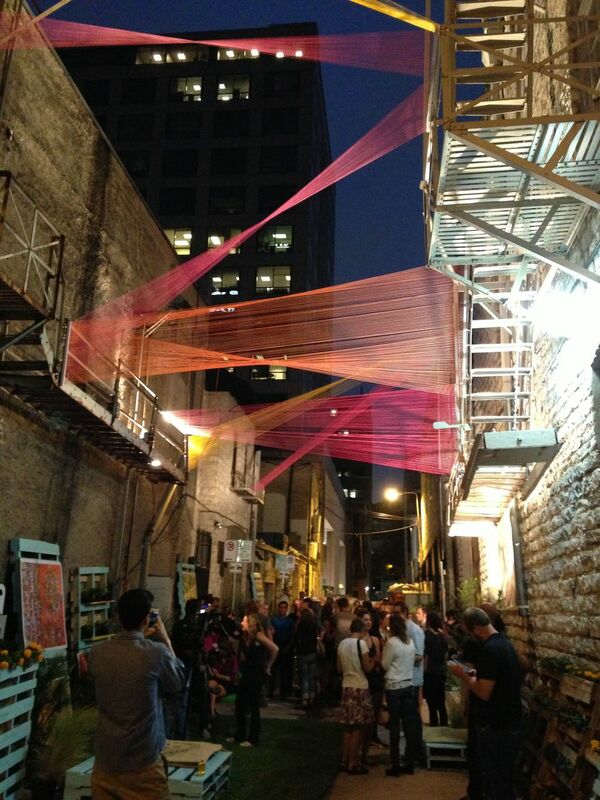 The downtown alleyway "20 Foot Wide" installation.Forest of Future Pigs: Austin's multi-group collaboration River of Gruel, Pile of Pigs (they give you dried cranberries, pistachios, and lapsang souchong tea! and later miso soup! and later -- well, just see it), plus The Future Show and Motor Vehicle Sundown via the Edinburgh Festival's roguish twin, the Forest Fringe. PIg Pile attendees feted with tea and treats. Sitting Inside Seven Dreams: Ant Hampton's fascinating three-day "Fantasy Interventions" workshop, about sparking a site-specific flash. I Self-Flagellate Over Stop Hitting Yourself: in which I wrestle the the Rude Mech's marvelous and worrisome latest. …oh my GOD I loved the Wellman…. : Steve Mellor KILLS the Mac Wellman story Muazzez. (I forgot to send a title with this piece, so my editor took the title from the subject line of the email I sent it in. It is a good summary, I'll say that. More to come, will post then, just so you don't think I'm being lazy about blogging. PS if you're in Austin, don't be ridiculous, go see some of the Fusebox. It runs through April 28. Jenny Larson and Hannah Kenah in Guest by Courtesy.I have a wee piece up at Cuturebot.org about Guest by Courtesy, one of the Austin-based pieces in this year's Fusebox Festival It's a terrific piece of physical, clown-ish comedy about gender and class (with marvelous passages of slowed-down time that they call "durations," in reference to the Anne Bogart's Viewpoints work, which inspired them). The piece was written by Hannah Kenah and devised in collaboration with Jenny Larson and Salvage Vanguard Theater, and is performed by Larson, Kenah, and Jason Hays. And it's all scored live by Graham Reynolds, what more do you want? This week only at the Scottish Rite theater, 3pm. PS: My piece includes bonus reference to my youngest brother's pre-school, gender-based arguments for refusing to eat grilled cheese. It's the second Wednesday of the month, so it must be my new Cabinet of Curiosities post. This one is almost all in the voice of an 11-year-boy who is quite upset, and with good reason, after a game of war near a creepy tree goes badly & weirdly wrong. It was a nice reach back to childhood for me (I LOVED playing war), and I hope I reached far enough. I also hope it gives you major creeps. 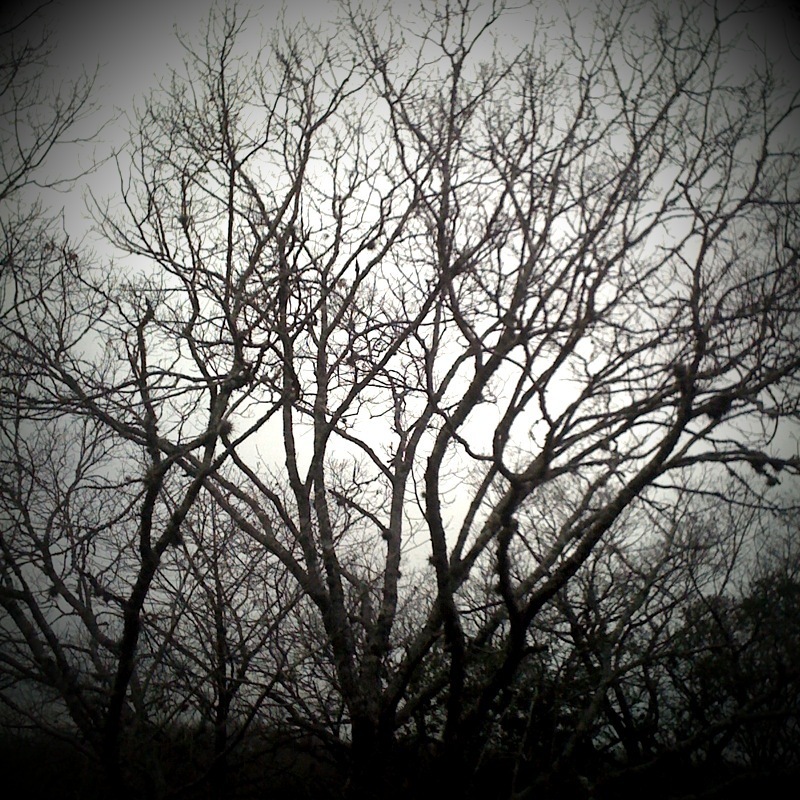 I took this with some ominous filter in McKinney Falls, a non-ominous state park. What else I'm doing is preparing--though how can you really prepare?--for the Fusebox Festival, the international time-based arts festival held in Austin each spring. I'll be blogging for them again this year, and linking to those blogs here, and I hope something I write sends you to see something at Fusebox. It's insane that some of the most exciting theater, dance, music, and visual and performance art being made in the world today converges here every April. Come get your mind blown a tiny little bit. There are a number of free and free-ranging events, as well. While I'm here, can't resist posting these two recent beautiful reviews of Summer and Bird. One's from a website called Girls Underground that tracks books and art about girls who travel Down. The other is from the blog of the Butler Children's Literature Center at Dominican University. Both of them made me so happy. I am rehearsing a play, drafting book #2, and am soon to tackle galleys for Summer and Bird. As I picture it, my life will be so much more spacious and free a month from now, when I'll have nothing to do but draft & draft. In reality I think Spacious Freedom is a state of mind I am not very good at achieving. But meanwhile, that Writer's Room project described in my previous blog post has migrated to HuffPo, which is lovely. I will actually give you candy, too, just like the song (George Clooney's aunt! famous song! look it up). 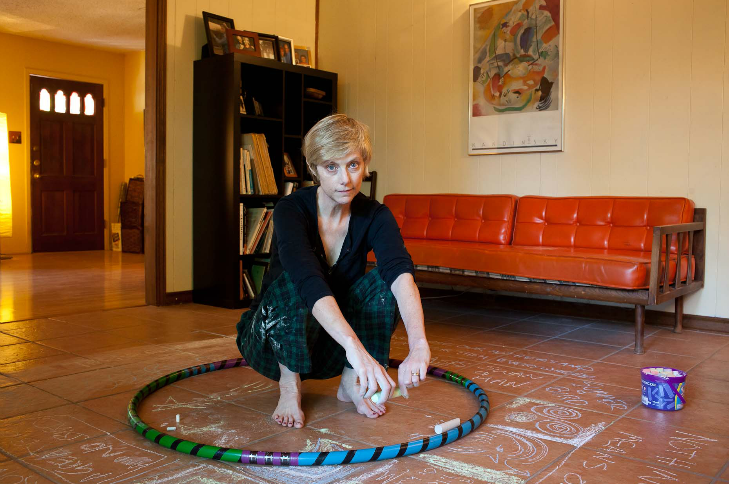 So this weekend I am participating in the Writer's Room Home Studio Tour, part of the Fusebox Festival here in Austin. I am one of several local writers inviting people into our homes from 11am-3pm Sturday and Sunday. We'll each be doing short readings on the hour. If you come at any other time, you can wander around--various writers have planned various things, and my own home will be tarted up a bit to look more like the inside of my head--and, at my house, have tea and chocolate and possibly muffins (all three are critical components of my Process). Perhaps we can talk about writing, or whatever you like. 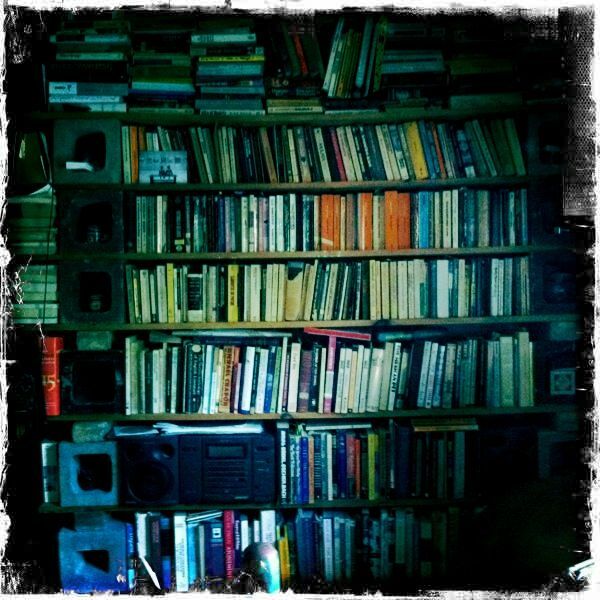 One wall of my writing room. Don't expect it all to be this fancy!I am not sure whether to be worried that no one will come, or that only my friends will come, or that lots of strangers will come. All those possibilities look scary! That said: please come! Here's a page with a couple of brief audio clips of me (interview and reading excerpts) related to this project, as well as an awesome photograph by Leon Alesi. And don't just come to MY house. The other participating writers are all blazing stars: Annie La Ganga & Bill Cotter, Spike Gillespie, Robert Faires, Wayne Alan Brenner, and Amparo Garcia-Crow. And I've now been to most of their houses, which are wonderful. You can see photos and hear excerpts of them on that Writer's Room site. See you this weekend, I hope (I think). 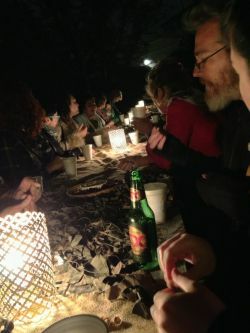 I did another Fusebox blog, this one about the fascinating Suzanne Bocanegra artist talk When a Priest Marries a Witch. The talk is performed by Paul Lazar, which is awfully cool. I'd like to get him to perform key moments in my life. I did not forget my promise to blog at least once a month--but I've been blogging at the Fusebox Festival website instead. Yesterday I actually bought a Stairway to Heaven at the Yard Sale in the Sky. And the day before I swung on one of the Red Swings.